Freshie Racing competing in Slovenia. Supplied image. 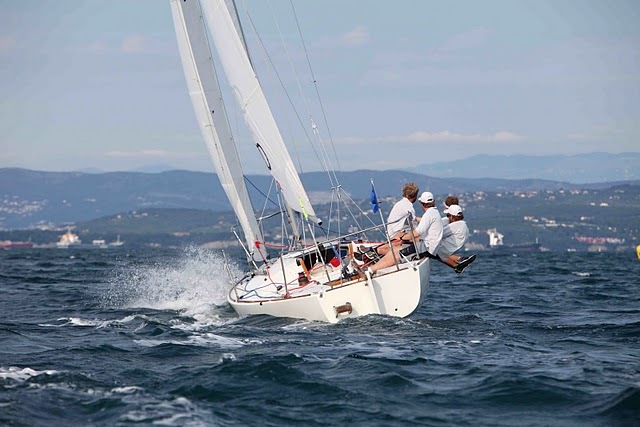 The Freshie Racing Team (skipper Peter Nicholas, Royal Freshwater Bay YC) finished second in the MIPC Match Race Cup 2010 in a tight fought final against Jure Orel from Slovenia last weekend. Racing in the beautiful town of Isola in Slovenia the team finished the split round robin with 4 wins and 1 loss in very light conditions. We finished equal 1st in our group qualifying for the final six. In the final six stage we raced the top three skippers from the other group. We sailed very strongly in good conditions with the wind ranging from 10 to 15 knots. We were only defeated by Jure Orel who is ranked 34th in the world. In a very interesting pre-start we sailed all over Orel who obtained a penalty on the start for failing to avoid us. Then we were pushed over the line and had to go around the committee boat with Orel gaining a significant advantage, but the umpires agreed not to red flag the incident, so they didn't have to do their penalty immediately. The final against Orel was some of the closest racing we have done all European tour. We came from behind in the final downwind leg to win by half a metre. In the second race we were defeated in a race full of incidents. It then came down to the final race - winner taking all. We won the start at the pin end and controlled the first upwind leg, before we engaged in two large luffs downwind resulting in contact. The umpires green flagged the first incident and then a green flagged second contact at the bottom mark. The last two legs of the race were very close with Orel getting the upper-hand at the top mark and managing to hold us off right to the finish. The team is now in Korea to compete in the Han River International in Seoul. Freshie Racing would like to thank Royal Freshwater Bay Yacht Club, North Sails Western Australia, Zhik, Ron Tough Yachting Foundation and Peter Chappell for their great support.